Yes the map discussion is over. I just want to clear up what I meant by the GTA analogy. There is the Grand Theft Auto Series (GTA 1 to 5). 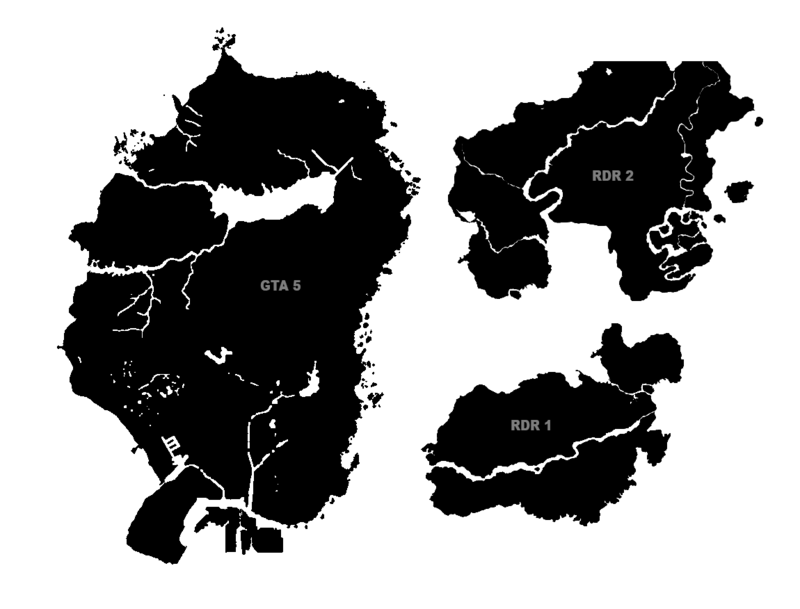 Then there is the 2d, 3D and HD eras or series (2D is GTA 1 and 2, 3D is GTA 3 to VCS and the HD is GTA IV and V). The separate eras are contained in the same shared universe, example Mr Leone in San Andreas, GTA 3 and LCS. And Packie in GTA IV and V.The eras are in general one giant arc pf interweaving stories. It can be argues that the outcome of GTA 3 was indirectly caused by events in VCS. 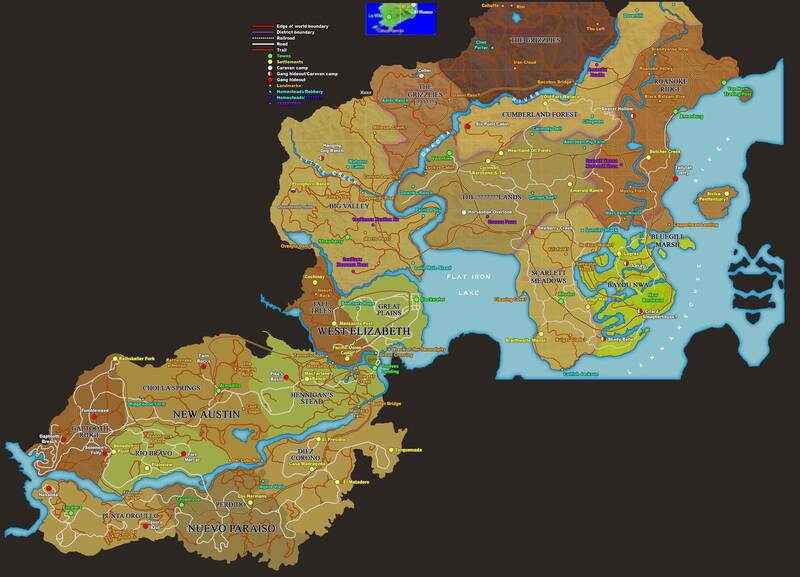 This is less of an extent in GTA IV and V however it is no doubt they are the same universe through loads of evidence. These two eras have no corssover, LC in 3 is not the same LC in IV. Similarly, there is the Red Dead series. Now I think the first word could be a word that means "other" or "miscellaneous" Areas. Like areas that don't fit any category. 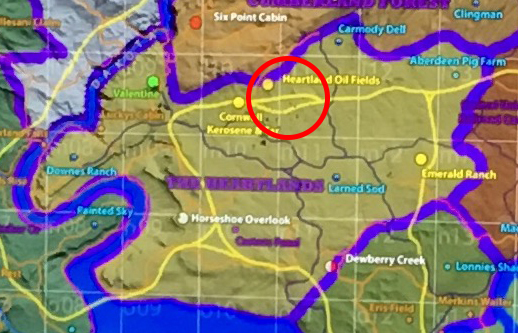 I'm 90% certain that the purple dot south of Strawberry ends with the words "Mining Camp". Does anyone else see that? Anyone else curious as to why the small purple text is far less legible compared to all other colors with small text? Why does the district line blur and overwrite the small purple text (in the Aberdeen Pig Farm region) but all the other colors with small text go over the district lines? if the map is real, I believe all text that isn't the small purple text is added in through photoshop. Not to say it's incorrect or won't be in the game, just saying it was added in after the fact. Whether or not the 'shopper was informed is up to you to decide. Reddit user yuv912 found evidence supporting the leaked map theory. I think it just has more to do with the color of it. The purple is lower contrast than the other colors and therefore it's harder to read and will bleed more. 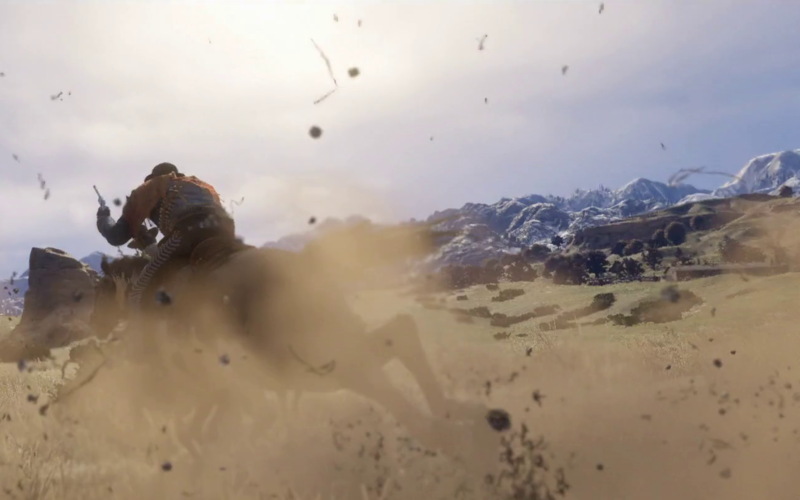 IGN did a trailer analysis which seemed to suggest that a lot of The Heartlands area is based on Oklahoma. 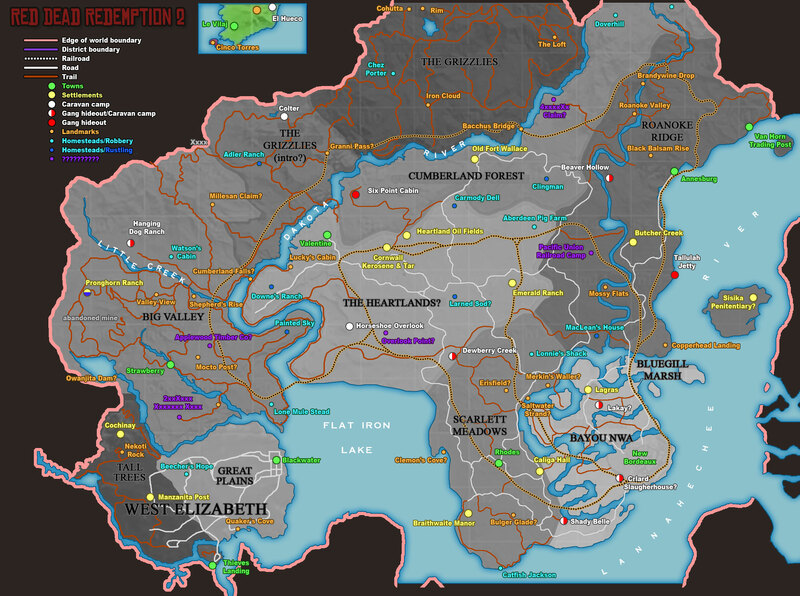 And then you have Bayou Nwa and New Bordeaux which are based on Louisiana, The Grizzlies which I presume is the RDR universe's version of the Rockies, Roanoke Ridge which I think is based on North Carolina, and an island which might be located in the Carribean with both Spanish and French colonial influences. Yeah I'm sure they smashed some different parts together that are based on real areas that don't actually touch for diversity sake. Not sure we can call this "evidence". Maybe I'm missing something, but this scene could be placed almost anywhere on the map ... ? We can't say the house is the pig farm, and the forest doesn't really look like a forest. I couldn't see the Mining part though. There seems to be more letters in that purple haze south of Strawberry. If it wasn't so damn hard to read the Purple title on the legend then it'd help give some context to all the purple labels in the world. That small lake by Rim (the Grizzlies, top of the map) ... I believe that's where the magnificant night-time shot with the campfire is coming from??? Alright, while I'm at it, I'll try debunking the oil field, even though I agreed with precedent posts. I'm really puzzled by this scene, I think there's a big confirmation bias going on here. First, the mountain we see are really hard to identify clearly and I don't think our deductions should be based on these as they don't offer very specific caracteristics. Now, I don't think it's the same thing we see in scene 13 and 15 either. In scene 13, we can see the "refinery" with two chimneys and trees on it's right but not on it's left. Plus there's this big windmill thing that's much taller than the other structures. Finally, what's further on the left seems really flat. In scene 15, we can indeed see some structures like the ones in scene 13, but I can't find the windmill (and I looked very hard for it). I think we can see the whole thing with the "every frame" pack, and it's not there, correct me if i'm wrong. We can also see a building on the left of the "oil field", but no big chimney here, again, correct me if I'm wrong. There also seems to be trees on each side of the building that we should see in scene 13 if it was the same place. 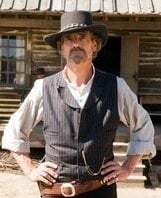 And the other side of the "oil field" is clearly elevated, so scene 13 could not be switched, as the left side of the screen was relatively flat. 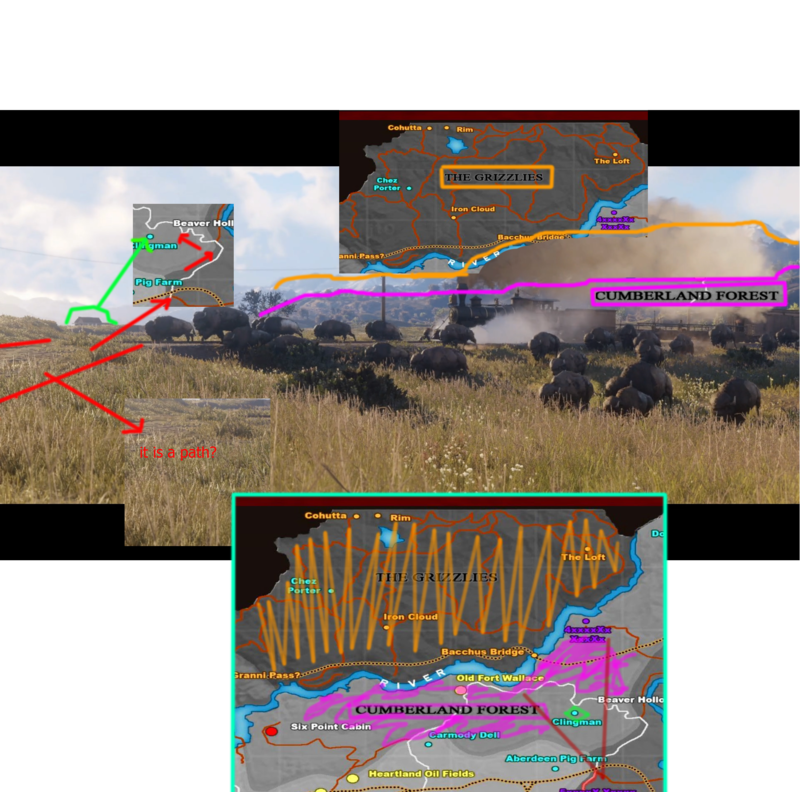 Finally, about the leaked map part : I don't think it matches either, even if we say the oil field in scene 13 is the same that the one in scene 15. Then, if 15 and 13 are two separate places, that means there's another oil field, which I havent found on the map. Just because there's an oil field (or, for that matter, that there is a house near a traintrack) isn't enough to say the map is real. And for now, nothing confirmed the map, there's only potential positions. 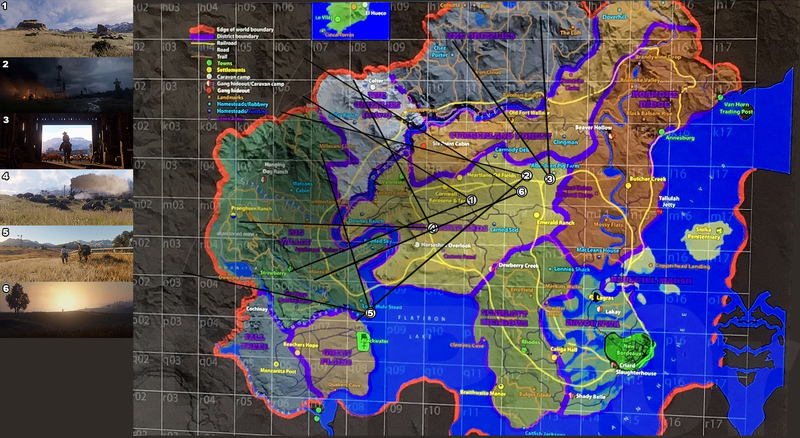 We would need multiple linked locations that fit into the map, or a clean proof to confirm it as real. Try to make Dupzor's post and mine correspond using the map, there's always something in the way, at least for now. So for now, I'm slightly towards "fake", but that could change ! Oh and please stop linking one specific house with any location, each house won't be marked on the map. Like, scene 7, there's a house near the windmill, but there's also a house in the background behind the fence. I don't think you'll find two farms that close on the map. What are the chances we will get the old part of the map as well? So. If "kerosene & tar" is the refinery like someone said before, it's really too close in the screens. The Oil Field marker is REALLY close to the river, but in the screens, there seems to be quite a bit of land behind it. That's not a river. The blue line is the river. 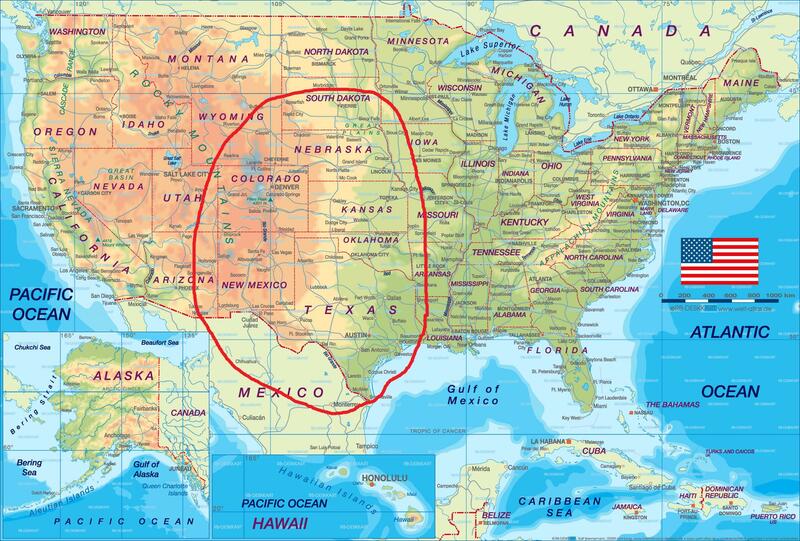 The purple line is just the border between different areas. Mocto Post is actually something Rest, seems like Monte Rest to me. The river below West Elisabeth is Lower Montana River, where as the river above it is Upper Montana River. Crlard Slaughterhouse is Criard Slaughterhouse. Criard is French for loud or yelling. I feel like this is how the trailer aligns with the leaked map. Obviously, there's no solid information, but I think we're on to something for sure. Shot 1: There's two black marks on the map that could actually be those two big rocks in the centre of the shot. And we know that the oil fields from the inferno shot is to the right of the horses. Shot 2: The oil fields seem to face the same sort of direction as shot 1 because of the mountains. Shot 3: It faces North based on the same mountain peak to the left of the cowboys and the oil fields. It's also a "Pig Farm", maybe Aberdeens on the map. Shot 4: It looks like it could be facing west based on geography, that train may be coming from Valentine across the heartlands. Shot 5: Based on geography, i get the feeling that this ranch is on the other side of the river. the mountains are closer and rotated to the left. Shot 6: Wide shot of the heartlands. The rocks and mountains match up. shot 4 actually takes place on place 3 on the map. Wait, where on the map was that shot taken? If that's anywhere near where I think it is, then the "Leaked Map" has to be real because of the positioning!